"Black people ignore that their ancestors, who adjusted to the material conditions of the Nile valley, are the oldest guides of humankind on the way to civilisation". Why Nelson Mandela and Martin Luther King are the only Blacks heroes that the dominant system drive us to celebrate? Why them and not the others? Is there a goal behind these choices? Nelson Mandela has consecrated his life to the fight against the oppression. His central role in the elaboration of a compromise putting end to the Apartheid need to be forever saluted. However the compromise stay very unfair for Black people. If there is a black middle class which has emerged, the Blacks only hold 20% of the lands of South Africa, while they represent 80% of the population of this rich country. They still are poor in majority while the Whites have a level of life of the Europeans. For that reason Mandela, imperfect as every men, has to be criticized. Martin Luther King as for him, has been a major figure of the fight against the segregation in the United States. He has succeeded, with others, to give a direction to this fight. So, he is a great man. But his choice in favour of the integration, and his faith in the kindness of the enemy, has led Black people in dead end. So it is necessary to criticize him too for what we can assimilate, from our very modest point of view, to naivety. 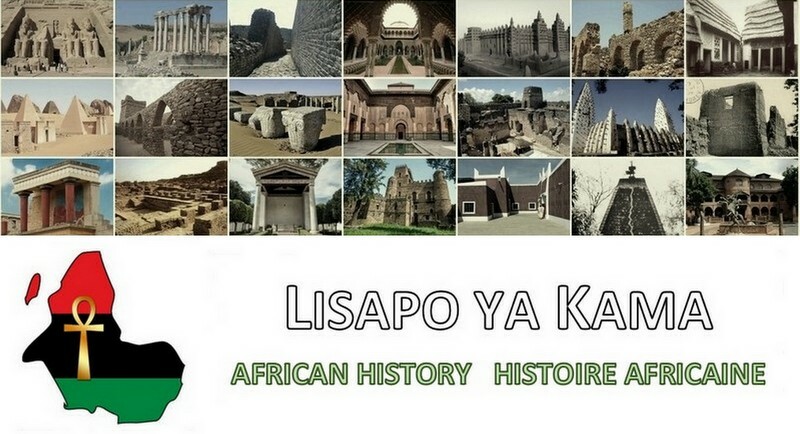 So we see that they are heroes who were sincere, who nevertheless have made compromises which finally have partly deserved Blacks and preserved the interest of Whites, who the westerners celebrate and drive us to celebrate. 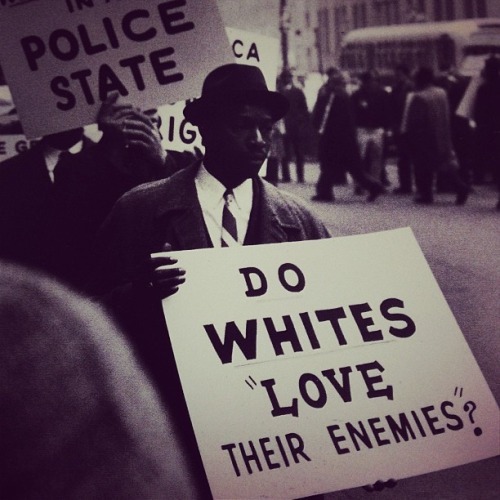 Those who have been and are intransigent, those who did not say to us “Love your enemy” every time, those ones are called all the names under the sun. Marcus Garvey? A dreamer. Cheikh Anta Diop? An insane. Malcom X? Devil. But we have to notice the exception of Aimé Césaire, an acerbic critic of the colonization, who is effectively known as a great man in the West. Since Black people according to the dominant system have to love their heroes who have made compromises. What about the westerners themselves? Let us take the example of the WWII. 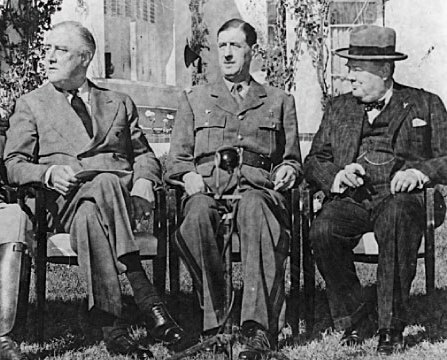 Winston Churchill and Charles De Gaulle who illustrated themselves in there are celebrated in their respective countries as the greatest men of all times. Franklin Roosevelt, president at that period, is known as the greatest president of the history of the United States, only behind Lincoln. What this three men have in particular? Their intransigence. They were determined to crush the German and Japanese enemies that they hated. Those who have made compromises have fallen in the dustbin of the history. Chamberlain, British prime minister who negotiated an agreement of Non-aggression with Hitler to avoid the massacres of the war, is seen as a naïve. Petain, president of France who signed in partly the surrender to preserve France of the German destructions is seen as the ultimate traitor. Yet these men, without being perfect, thought by this way saving the life of their people. For having made compromises, they are boycotted. While when ours do the same, they are supposed to be our supreme icons. On the left: how the English have loved their German enemies, by turning the other cheek; the bombing of Dresden in Germany made 25,000 deaths. Winston Churchill made free bombings over there, Dresden did not have a military significance. On the right: how the American have loved their Japanese enemies. 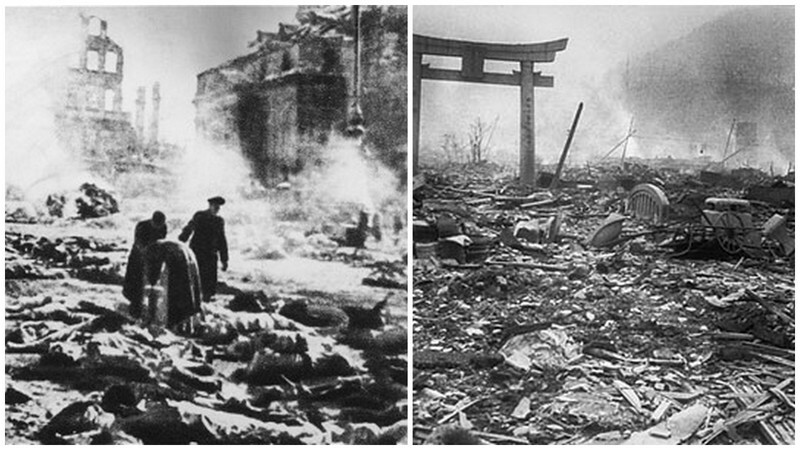 The nuclear bombing of Hiroshima made about 90,000 deaths. The atomic bomb has been developed under Roosevelt and dropped by president Truman. When Petain salutes Hitler, he is a traitor. When Mandela salutes De Klerk he is a great man, pure, an accomplished ocean of love. The message sent to Black people by the dominant system is very clear. Love your enemy, continue to believe in the universal kindness. Your salute will come of your capacity to give up. What does the white child say to himself when he has Churchill for hero? That the heroism is to not give up. What does the black child say to himself when he has Mandela for hero? That the heroism is to compromise. The westerners, through their Media, search to weaken us. And we have finished through Mandela and King, to convince ourselves that the enemy will finish to become good one day, that it is necessary to give him time, to slowly explain him the things, wait, negotiate, compromise…to better kill us. But what is necessary to add too about these two men, is that we only popularize the moment of their life where they searched the compromise. No way to speak too much of Nelson Mandela, leader of the armed branch of the ANC, who had put bombs and was on the list of the terrorists in the West. No way to speak of Martin Luther King, who started to doubt about the integration and asked reparations for slavery. These two men have had periods of intransigence, the first at the beginning of his fight and the other at the end, which the West avoid the most making know. Nelson Mandela in black glasses in the 60s. He was the chief of Umkhonto we Sizwe, the armed branch of the ANC. 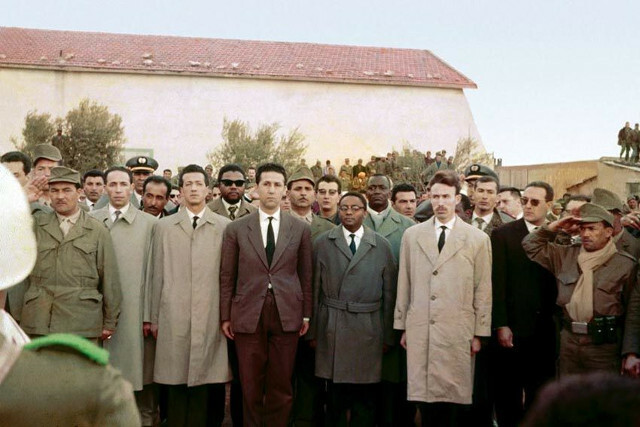 He is there in military formation in Algeria next to Ahmed Ben Bella and Houari Boumediene, the first two presidents of Algeria. 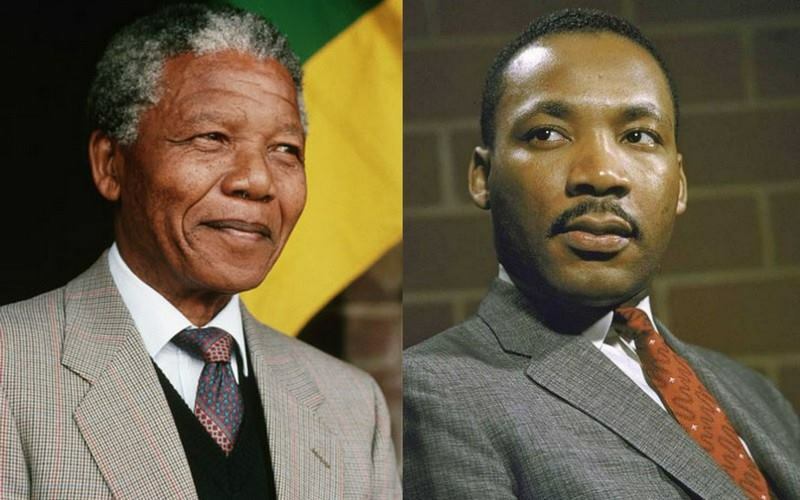 To sum up, if Mandela and King are effectively great figures of the black history, the hypocritical love that the West give to them has a clear objective. We see that if these two men had been westerner, they would have been boycotted of the History. We are therefore under the fire of a propaganda which aim to low us continuously. So Africa not only has to define who its heroes are but above all the continent must master its media to be able to define itself and be impervious to the propaganda of the dominant system.